David Walker is no newcomer to running a business. After an 11-year career in sales, he owned several service-based businesses where he learned the ins and outs of entrepreneurship. Now, he’s bringing his experience and passion for business to Shack Shine. 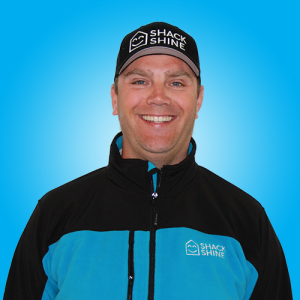 Here, he tells us why he decided to join the Shack Shine family. Why did you choose to join Shack Shine? I was very impressed with their core values and customer focus. I am excited to build a strong, recurring revenue customer base. I want the majority of homes in our territory to use Shack Shine’s services. In my previous life, I had an 11-year career at Telus Communications where I learned a great deal in various positions, finishing off as a National Sales Manager. In 2008, I left Telus and began my entrepreneurial journey. I have since owned and lead several businesses ranging from retail, car washing, bulk fuel delivery, staffing and recruiting. I am most looking forward to building a phenomenal team around me to provide exceptional service to my territory. I coach my sons’ (11 and 9) baseball teams in the spring. I try to get out golfing when I have time, and I love to travel with my wife and family. I am active in the community by being involved with my sons’ sports teams. Baseball in the spring and hockey for the rest of the year. I also take an active volunteer role with my kids’ school by helping out with events and field trips. My family is my motivation in life. The root of everything I do is in an effort to better the quality of life and open up opportunities for my wife and kids. What makes Calgary Metro West unique? I am lucky to live in the Calgary Metro West territory, which offers short commutes to downtown and quick access to the mountains west of the city. West Calgary sees more climate change than the rest of the city which leads to more dirtiness, wear and tear, and opportunity to shine shacks! Although a self-declared Calgarian, I was born in London, England. I have many relatives and friends there still and I visit as often as I can. However, I moved to Calgary when I was two years old, so I was not able to retain the “cool” accent. Please join us in welcoming David Walker to the Shack Shine family!